If you're planning a family vacation to Cleveland, this Northeast Ohio city has plenty of entertainment options for your kids—from the Zoo and Children's Museum to a Cleveland Indians game, you're sure to find something to do. Although travel in the summer will yield more activities, there's plenty to do year-round in the CLE including winter sports in Lake Farmpark and Christmas cheer at the Christmas House; blooming flowers in the Cleveland Greenhouses in spring; summer swimming at Lake Erie beaches and splashing at the Wildwater Kingdom; and plenty of beautiful foliage and apple picking opportunities in the fall. Explore the following list and plan your itinerary for you and your family on your next vacation to Cleveland, but just make sure to check the linked website for each attraction for hours of operation, admission fees, and holiday closures. Exhibits include Dinosaur bones, natural gemstones and fossils, and a huge section on Ohio birds, plant life, insects, and archaeology, and a planetarium teaches kids and adults all about the moon, the stars, and the galaxy. Also located at University Circle, the Children's Museum gives kids the opportunity to learn by experience and interacting with the environments created for them to better understand science. Permanent exhibits include "Splish! Splash!," which is all about water transportation; "Bridges to the Community," where kids can push their own grocery carts, go through the check-out line, "bank" with play money, and pump their own "gas;" and "The Big Red Barn," based on the book by Margaret Wise Brown and designed for the youngest kids (aged up to 4) and their caregivers, featuring a working silo, a barn slide, and an apple orchard. Cleveland's best free attraction is not just for adults, the Cleveland Museum of Art, also located at University Circle, is filled with more than 43,000 works of art from virtually all periods and genres; admission to the museum's permanent collection is free daily. Of particular interest to kids is the armor court, a light-filled interior courtyard packed with medieval suits of armor, weapons, and tapestries. What's more fun than seeing dozens of shiny antique cars, trucks, racing cars, and airplanes? The Crawford Auto-Aviation Museum is home to tons of these vehicles, all simply and accessibly displayed. Located in the lower level of the Western Reserve Historical Society building, the museum is fun for car lovers of all ages, and the Crawford has a sizeable collection of early Cleveland-made autos. Another free attraction, the International Women's Air and Space Museum (IWASM), located inside the lobby and west wing of downtown Cleveland Ohio's Burke Lakefront Airport, celebrates the contribution of women in air and space flight with a rotating schedule of temporary exhibits. The many exhibits are the IWASM illustrate the contribution of women to aerospace history, beginning with early 19th-century European hot air balloonists and continuing through to contemporary women astronauts. Items on display include Amelia Earhart's flight suit, the tail of Ruth Nichol's Lockheed Akita, and biographies of scores of women who contributed to flight and space history. Keeping with the space theme, the NASA Glenn Research Center is a vital part of the NASA space research system, and though most of the exhibits have moved to the Great Lakes Science Center, the facility near the airport on Brookpark Road offers monthly tours once a month from April through October. The tour and admission to the Research Center are free, but for security reasons, admission is restricted to United States citizens and legal residents with a government ID. For current dates, check the center's website. Cleveland's most popular attraction is fun for visitors of all ages, offering a massive permanent collection that features profiles of all of the Rock Hall inductees, with headphones that give you the chance to listen to the artists' music. There's also hand-written lyrics, stage costumes, and thousands of pieces of memorabilia, donated by the artists and their families. Make sure to visit the frequent temporary exhibits in the top floor gallery—recent shows have featured The Doors, Bob Dylan, and the Beach Boys. The Great Lakes Science Center at Cleveland's Northcoast Harbor, just down the road from the Rock and Roll Hall of Fame, invites visitors of all ages to "learn by doing" with their 400 hands-on exhibits. You'll find permanent installations on technology, the environment, the body, and the Great Lakes themselves as well as interesting temporary shows and an adjacent OMNI-MAX theater—perfect for a rainy day on your vacation. A part of the Great Lakes Science Center, the William G. Mather Museum is an authentic 1925 Great Lakes bulk freighter, permanently moored at North Coast Harbor in downtown Cleveland. This 618-foot, 14,000-ton vessel is now a museum and visitors can climb aboard and get a glimpse at what life on Lake Erie was like in the early 20th century. The William G. Mather is open from May through October on Saturdays and Sundays. Another government-run attraction, the Federal Reserve Bank Museum of Money opened in 2005 and features 30 exhibits about the history and the power of money. The most striking feature is a 23-foot tall money tree located across from the museum's entrance. This interesting museum is located in the Federal Reserve Building on East Sixth Street in downtown Cleveland and open Monday through Thursday. The Cleveland Metroparks Zoo is set amidst 165 wooded acres off of Fulton Avenue, just four miles south of downtown. You and your kids will discover a fascinating collection of animals from all over the world, many residing in natural, open-air settings. Favorite exhibits include the African elephants, the "Wolf Wilderness" exhibit, and the latest addition, the "Australian Adventure." A two-acre, enclosed Rain Forest features but a small fraction of the myriad of wildlife found in the tropical jungle. The Greater Cleveland Aquarium, located in the Powerhouse on the west bank of the Flats, opened in 2012. This Cleveland attraction features more than one million gallons of water and marine life that ranges from local Lake Erie fishes to exotic species from around the globe. The 33,000-acre Cuyahoga Valley National Park, located between Cleveland and Akron, offers 125 miles of hiking trails, designed for all skill levels. The park also has a junior ranger program, where kids can learn more about the plants, trees, and animals as well as the history of the early Western Reserve. The park is open daily year-round. Located along Lake Erie between Lakewood and downtown Cleveland, Edgewater State Park features biking and hiking trails, a playground, picnic facilities, and a 900-foot swimming beach--all just minutes from downtown. The spot also offers one of the best views of the Cleveland skyline. Ever since Johnny Appleseed wandered Ohio's countryside, Cleveland and northeast Ohio have been known for their juicy and delicious apples. Each autumn, from around mid-August to November, many apple farms open their doors to visitors and offer a variety of apple treats, hayrides, bushels of apples, and other events appropriate for all ages. From September through November, farms throughout northeast Ohio carve out mazes in their cornfields and welcome the public to try their luck at finding their way to the end. Visiting places like Cleveland Pumpkin Patches are good, inexpensive ways to enjoy the fall landscape and culture of agriculture in the region. Lake Erie isn't necessarily known for its beaches, but one notable exception is the beach at Mentor Headlands Park, east of Cleveland in Lake County. This long, family-friendly stretch of white sand is ideal for getting lost in a good novel, watching the waves lap up at the shore, or combing for seashells. There's even a picturesque lighthouse. The park has ample free parking, just off the beach. Lake Farmpark is a delightful working farm and learning center, just 25 miles east of downtown Cleveland. See 50 different breeds of livestock, marvel at honey and maple syrup being made, and enjoy one of the many special events, such as the annual Holiday lights display at the park. This Cleveland Metropark offers entertainment geared towards families and boasts itself as a science and cultural center devoted to agriculture and farming. Preston's H.O.P.E. (Helping Others Play and Enjoy), located in Beachwood, is a playground designed to allow children with a variety of disabilities to play with their families and other children. The first such playground in Northeast Ohio, this 60,000 square feet playground is packed with play structures on multiple levels connected by ramps. Activity panels with lively motion activated music are found throughout on walls, pathways, and on play structures. Cleveland's Rockefeller Park Greenhouse, located just off of Martin Luther King Blvd near University Circle, houses a wonderful collection of exotic and native plants. This peaceful and fascinating place is rarely crowded and offers guests extensive orchid and tropical plant exhibits as well as the spring bulb and December holiday plants displays. Of particular interest to kids is the room full of cacti and other southwestern plants. Memphis Kiddie Park has been delighting young children—and their parents—since 1952. The park boasts miniature rides, old-style concessions, and an arcade that are all geared towards children 1 to 8 years old. Also, an adjacent 18-hole miniature golf course is rated one of the best in the state, so you can certainly make a day of being in the area with your children. Located about 45 minutes east of downtown Cleveland in Kirtland, Holden Arboretum is a showcase for indigenous Ohio plants, flowers, trees, and wildlife on a property of over 3,000 acres. The beautiful park features specialty gardens, miles of hiking trails for all skill levels. The garden also hosts a full schedule of special events, many of which are geared towards younger visitors. During the summer and fall months, they also operate "Buckeye Bud's Adventure Woods," a zip line tour designed for families with children ages 3 to 10. The Botanical Garden's Children's Garden is a magical place located at University Circle, nestled behind the Rose Garden and down from the Woodland Garden. This central paradise offers a variety of flower and vegetable gardens with kid-size signs, gates, and fences. Fun features include a wheelchair accessible tree house, a cave, worm bins, a watery bog, and a scrounger's garden. It's one of the few Children's Gardens in the United States. The Nature Center at Shaker Lakes, founded in 1966, is a peaceful green space nestled among the gracious houses of Shaker Heights, just east of Cleveland. The facility features a variety of trails that illustrate six natural habitats, as well as a nature center with exhibits about the Northeast Ohio landscape. Best of all, the admission is free! Located south of Cleveland near Bath, Hale Farm is a working museum, situated adjacent to the Cuyahoga Valley National Park. Once the home of early the Western Reserve settler, Jonathan Hale, the museum features livestock, 19th-century working artisans, and the original red brick farmhouse. The site offers visitors a unique look at life in the Western Reserve during the time shortly after the War Between the States. Operating as a working farm with artisan workshops—including a glass-blowing and a pottery studio—Hale Farm features volunteers in period dress, period music, and a blacksmith shop, spinning and weaving workshop, candlemakers, and tons of activities for the whole family. The I-X Indoor Amusement Park, held for a month each spring in Cleveland's I-X Exposition Center, is 20 acres of fun for the whole family. There are dozens of rides, live entertainment, fair food, special events, and even local celebrity appearances. The event features dozens of rides, all for one admission price. One of the highlights of the I-X Indoor Amusement Park is the 35-foot tall permanent Ferris wheel with its own glass atrium. On a clear afternoon, you can see all the way to downtown Cleveland. Cedar Point, the second oldest amusement park in the country, sits at the end of a slender strip of land at the edge of Lake Erie. Located about an hour and a half's drive from downtown Cleveland, the park boasts the largest number of roller coasters in the world, ranging from the venerable, wooden "Blue Streak" to the 420-foot-tall "Top Thrill Dragster." Northern Ohio can get pretty steamy in the summer and pretty desolate in the winter months, but Great Wolf Water Park in Sandusky offers a family-friendly solution to both weather situations. One of a chain of family resorts, Great Wolf is located just off of the Ohio Turnpike, was the first Ohio indoor water park, and is still one of the best. The highlight of the resort is the 33,000-square foot indoor water park that features an interactive water fort with 12 levels, a zero-depth Cub Paw pool, and lots of slides, swings, and other fun water toys. Other facilities at the resort include a variety of family-friendly rooms, including the kids' cabin suites and family suites with fireplaces; two restaurants; a fitness center; a huge arcade; and the Cub Club children's activity center. The two toboggan chutes in the Cleveland Metroparks are open Thursdays through Sundays between late December and the end of March, weather permitting. Located in the Mill Stream Reservation in Strongsville, they provide winter fun for the whole family. There's also a snack bar and warm-up chalet. The chutes are 700 feet long with a vertical drop of 70 feet, sending riders down exciting dips and turns toward the bottom, but riders are required to wear mittens or gloves and must be at least 42” tall to ride. Amazone, in Medina, is a jungle full of excitement for children, offering hours of adventure through two indoor playgrounds themed after the Amazon Rainforest. These facilities come equipped with all of the climbing, mazes, and slides a kid could hope for, and the Laser Tag play place runs deep into the Amazon Jungle with the best laser tag system available. Kids can also get lost in the Arcade room that has all their favorite arcade games. 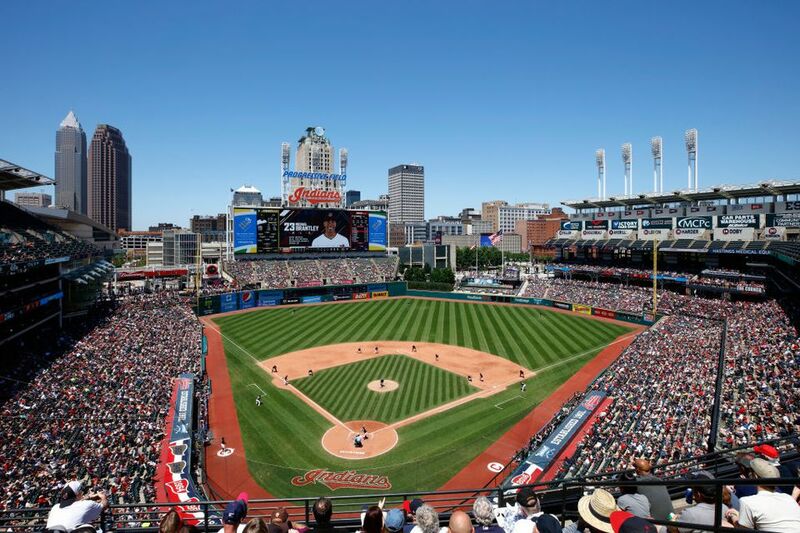 Nothing beats watching baseball on a sunny summer's day -- for kids and adults alike, and Progressive Field offers a number of activities for kids in addition to regular-season games. There's the fun ballpark food and Kidsland, a special area that gives kids the opportunity to play with a variety of toys and visit with the team mascot, Slider. There's even a kid's concession and kid's team shop. LeBron may be gone, but the Cleveland Cavaliers still know how to entertain a crowd. From October through April, you can see the home team compete with stars from around the NBA at Quicken Loans Arena. Plus, the Cavs remain one of the few affordable sporting events left in Cleveland. Tickets start at just $10. Though tickets aren't as affordable to Browns games as they are to Cleveland Indians or Cavs games, cheering on the Cleveland Browns each fall is a north-coast tradition. FirstEnergy Stadium has a Family Zone, an alcohol-free area with mascots and kid-friendly food options in sections 541-543. If a Browns game out of your budget, get an insider's look at the season's team for free at the summer Cleveland Browns Training Camp in Berea. The camp runs from late July to the first regular season game. Located in Canton Ohio, The Pro Football Hall of Fame was opened in 1963 with 17 charter inductees. Today, the museum features scores of players, coaches, and owners as well as exhibits about football, the Super Bowl, and the history of the game. In addition to profiles on the more than 200 inductees, there is a dazzling display of Super Bowl rings and a "behind the scenes" film about a team preparing for game day, making this a must-see for any football fan in your family. Clevelanders love the circus and several stops in and around the North Coast during the year. The Carson and Barnes Circus sets up around greater Cleveland in the middle of the summer, and smaller companies, like the Kelly Miller Circus, play small, rural communities during the summer. Greater Cleveland has a circus connection—Geneva was once home to the Walter Main Circus, a popular, traveling show in the late 19th and early 20th centuries. Cleveland has the largest theater district between New York City and Chicago; the theaters of Playhouse Square host a full year-round schedule of theater, dance, music, and other performances—and not all of them are geared towards adults! There are puppet shows, kid-friendly matinees, and kid-favorite performers. What's more: Playhouse Square's SmartSeat program lets you buy tickets for selected events for just $10. For the current schedule, visit the Playhouse Square Web site. The main branch and 28 neighborhood branches of the Cleveland Public Library house more than 10 million books, tapes, DVDs, and CDs—all available to loan to Cleveland area residents. Visit the historic main library on Superior Avenue, between East 3rd and East 6th Streets for its classic architecture and peaceful, outdoor reading courtyard. Many branches also have children's sections and host special reading hours and other kid-friendly events. In addition, the Clev-Net system of regional libraries extends from Lorain to Madison to Medina and allows you to order any book in the system and have it delivered to your local branch. It's one of the best such systems in America! Big Fun, located on Cleveland Heights' eclectic Coventry Road, is a combination of a vintage toy store, candy store, and a monument to pop culture. The store, which is packed to the rafters, has been called one of the "coolest stores in America"—for good reason. You'll find toys here that you had as a child as well as vintage collectibles and more quirky, fun inventions. This whimsical place is sure to delight kids of all ages. Peninsula, located between Akron and Cleveland just outside of Cuyahoga Valley National Park, has long been home to an interesting collection of art galleries and craft shops. What many don't know is that the Peninsula Arts Center, located just off of Route 303, is a brilliant combination of art gallery space, art classrooms, and even a culinary arts center. They offer a full calendar of art classes for adults and children—some you can even take together! The Goodtime III is Cleveland's largest sightseeing vessel that's a favorite of all ages. The spacious, four-deck ship operates a regular schedule of Lake Erie and Cuyahoga River narrated sightseeing cruises from June through September as well as periodic theme and kids' cruises. The Cuyahoga Valley Scenic Railroad runs through Ohio's only National Park, the Cuyahoga Valley National Park, from Cleveland to Akron and Canton. A variety of excursions are offered year-round and each trip is a different adventure filled with fun, history, and beautiful scenery. Popular excursions for kids include the "Thomas the Train" theme rides, the Halloween trick or treat events, and the holiday "Polar Express." The U.S.S. Cod is a retired World War II SS-224 submarine, moored at Cleveland's North Coast Harbor, near the Rock and Roll Hall of Fame. The U.S.S. Cod, a National Historic Site, is the only such vessel to be kept intact. Visitors can climb the vertical ladders through its hatches, just as the sailors did during active duty! "A Christmas Story House," located in Cleveland's Tremont neighborhood, was the main set for the well-loved 1983 Christmas movie, "A Christmas Story." The house is newly restored and is open year-round as a tourist attraction and museum. If you're a fan of this film, you'll recognize notable props like the leg lamp and be able to re-experience the magic for yourself. President James A. Garfield's home, Lawnfield, is located just off Route 20 in the heart of Mentor. The 7.82-acre estate, once owned by our 20th president and his family, combines history, design, and a glimpse at what life was like in northeast Ohio at the end of the 19th century. The Lawnfield property, now administered by the National Park Service, includes spacious main house, several out-buildings, and a visitors' center with changing exhibits about Garfield's life, his presidency, and his death. The James A. Garfield Historic Site is open daily from May 1 through October. Geneva-on-the-Lake, located on the shores of Lake Erie about an hour's drive east of Cleveland, was one of Ohio's first lakeside resorts. The resort area's mile-long strip features something for kids of all ages, including a giant slide, a miniature golf course, wineries, antique stores, a sparkling beach, and a variety of restaurants. Spend the day or stay overnight in one of the area's hotels or cozy cottages. Remember piling into the car when you were a kid and heading to the drive-in? Did you know that northeast Ohio had one of the first drive-in theaters with the debut of Akron's Starlight Auto Theater in 1937? A few of these iconic theaters still exist in northeast Ohio, from Sandusky to Mayfield Heights, including the Aut-O-Rama Twin Drive-In just outside Cleveland.